This week a member of one of our churches reminded me that the Sunday after Easter could be perhaps one of the most important Sundays of the year. Traditionally, the second Sunday of Easter focuses on the disciple, Thomas. In the Gospel of John, chapter 20, it recalls that when the Risen Christ appears to the disciples while they were together behind locked doors, Thomas was not with them. While many of us focus first on the "doubts" of Thomas, author Michael E. Williams suggests that perhaps we should consider that Thomas was "the only disciple courageous enough to leave that locked door." For when Thomas returns to the others, he wants to be reassured with the same experience they have had. I personally don't think that this makes Thomas any more of a doubter than the others were before Christ stood before them saying, "Peace be with you." The truth is they all had doubts, just as we all had, have and will have doubts. The most important thing is what we do with those doubts. Our doubts only become a problem if they paralyze us into inaction, complacency or relinquishing our power to do something or to believe in something. In the business world, there is a term for this state of immobility. It is called FUD, an acronym for FEAR, UNCERTAINTY AND DOUBT. It is often used by businesses to throw their competitors off their game and render them ineffective. For the disciples, the presence of violence, evil, and death among their circle brought about the FUD factor. Those threatened by Jesus' radical message had come after him; the crowds who had just cheered him on into Jerusalem had turned on him shouting, "Crucify him"; and even those who were considered to be Jesus' closest friends had betrayed him. The aftermath of Jesus' arrest, trial, and crucifixion was certainly fear, uncertainty, and doubt. The FUD factor had set in and the disciples were locked away in fear, uncertain what was to come, doubtful that love, hope and the Prince of Peace could rise up again. They could have become stuck. They could have given up. They could have walked away. Yet, they stayed together; and when the Risen Christ appeared to them, they joyfully received him in their presence and they believed. When the Risen Christ appeared before Thomas and he saw and touched the marks and scars on Christ's body, he allowed himself to believe once again, proclaiming, "My God and my Lord." However, I have a sense that even the presence of the Risen Christ among them did not make all fear, uncertainty, and doubt go away. There was still much to fear, especially as word would get out about Jesus' resurrection. 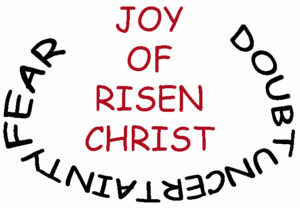 There was still much uncertainty about how long the Risen Christ would stay with them and what would be next for them. There was still much doubt about if they would be able to live up to Christ's expectations and purposes for them going forward, as they had stumbled and fallen in their mission so far. Yet, the turning point, the tipping point is that they chose not to give in or be ruled by the FUD factor. Before his ascension, the Risen Christ commissioned the disciples to go out and make disciples. His only plan and purpose for his followers going forward was to spread the good news that the power of God's love, forgiveness, and grace is stronger than hate and intolerance. In order to do this, they had to believe it for themselves. The same is true for us today. The baton of Christ's plan and purpose has been passed down to us, the living, breathing Church of Jesus Christ. Our sole purpose as the Church, as collective followers of Jesus Christ, is to make disciples by sharing with them our stories, our experiences, our testimonies of how God's goodness and love is stronger than all evil and hate. I believe more than ever the world needs our message. People need to hear and experience the truth of the good news. We have been called and compelled by our Lord to share the good news to a world that is often confounded, compressed, depressed, and overwhelmed by the bad news they experience too often. Too many people have locked themselves away in fear, uncertainty, and doubt, unable to move creatively, joyously and wondrously towards the certainty of hope in the goodness and love of the Risen Christ among them. Let us be an Easter people. 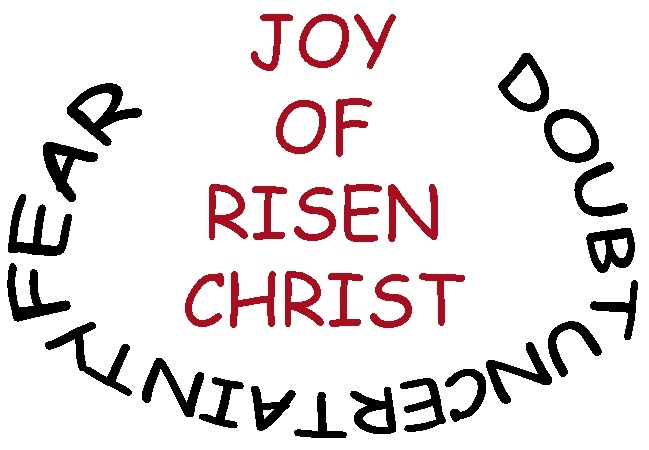 Let us be those who are able to joyfully receive the presence of the Risen Christ in our lives. Let us be those, who despite our own doubts, can still proclaim of Christ, He is "my Lord, my God." Let us not be consumed by the FUD factor, but instead choose to rise above fear, uncertainty and doubt, and then, teach others how to do the same.